Recently I wrote a post about being at a crossroads in my life. 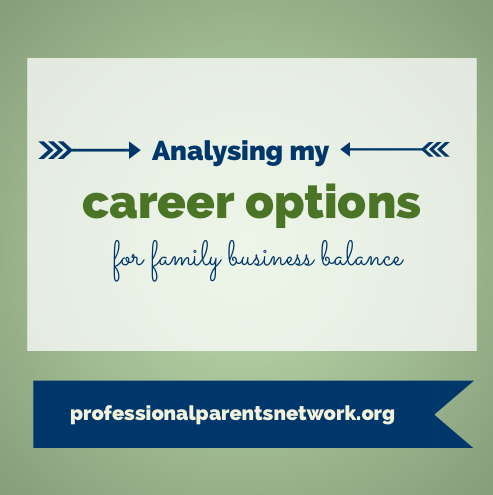 The next stage I’m going through at the moment is thoroughly analysing my career options, particularly taking into account my search for family business balance. I thought sharing this process may be interesting for some of you to follow, but I’d also love to know – did you go through this as well? Are you going through it now? Is it something you did consciously? A quick summary for those who haven’t read previous posts – I’m a 38 year old mother of 6 & 4 year old girls, who are now both at school. I’m a Dutch Australian, originally from Brisbane but now living in The Hague, The Netherlands. I hold a Bachelor of Business (double major marketing & tourism) and have run my social media & marketing business, Zestee, for 5 years. You may wish to read the about section or take a look at my LinkedIn profile. So, here is a list of my options and my current thoughts of each. There are lots of stay at home mums. My mother was one. Some friends are. I’ve never seen myself as one though. When I first had my children I was fortunate to be in the position to choose not work for the first year after they were born. Well, that was the plan. For a few months after both girls were born, I focussed solely on them and it was wonderful. After about month 3 though, I started feeling rather isolated and miserable. Studying and starting my business brought back some balance. When we relocated from Australia to The Netherlands last year, I took 6 months “off” to care for our youngest and I feel had a reasonable experience of me not working. It didn’t work well in our family. We were all much happier when my “baby” went to daycare 2 days a week and I started my business. Now she’s now gone to school and most importantly, me not working is not really a feasible option financially for our family. Verdict: No. So the next option? I continue to build my business. Considering the amount of time I’ve put into my business over the last 5 years, this feels like the most logical option. For a long time, I’ve loved it and though it’s hard work, it seemed the best option for many reasons. However there have been enough doubts cropping up to make me question this. Most importantly – is it financially sensible and sustainable? As was my vision from the beginning, after a lot of hard work, I am growing beyond a small sole trader/ZZPer. However to continue to grow, I feel I need to invest a lot more time and money. In a difficult market and for various other reasons, for the first time since I started, I am wondering if I want to keep my business at it’s current level, focus on growth or perhaps even start thinking of an exit strategy. This is a really difficult decision, so I am going to work with a business coach over the next few months to help make this. Verdict: Possibly but changes and investment will be necessary. So the next option? I find a part time job. This was something I would ideally have alongside my business (as I have had in the past) but is proving a lot harder than I had imagined. The Netherlands does have a relatively high percentage of part time jobs apparently – but it seems the majority of those have been created for those who first worked full time and/or are native Dutch speakers and/or are in different industries/specialties. I have been actively looking for part time work for more than a year now, and am finding nothing suitable. I’ve actually had a couple of leads & interviews but unfortunately they were either looking for full time, or “part time” meant at least 26-32 hours a week. I do realise my needs are very specific – 16-24 hours a week, in The Hague and local area, as a native english speaker, in the field of marketing & social media. Hard profile to fit perhaps but also have a lot to offer the right employer. I’ve registered with a recruitment area that specialises in my field and had a meeting to discuss possibilities that may arise. There is nothing specific but some possibilities. Verdict: Still looking. So my next option? I find a full time job. There seems to be much more potential out there if I was able and willing to work full time. As a social media specialist, recent job ads I’ve seen in Amsterdam for Twitter and Facebook and in The Hague for Apple look amazing. However do I want to work full time. Can I? Let’s say that I did overcome a number of hurdles including being out of the full time workforce for quite some time, being up against tough competition, and needing to organise plans for childcare (and back-up plans for children’s illness!) to name a few, I’ve heard from many other women that working full time is just “too much”. In particular, though my children are both at school, this is essentially “part time” for at least another couple of years. (They go from 8.30am-3pm three days a week and 8.30am-12pm two days a week). Reading some job descriptions gets me excited but I just don’t think the corporate world, not to mention my home life, is set up at the moment for both parents to work full time. Out of school care is extremely expensive and though subsidised to some extent by the government, also likely to “wipe out” most of my full time wage. Verdict: No. Unless it was a really amazing position I was perfect for and had some flexibility for the family. So the next option? A bit of a “late starter” at university, I didn’t attend when I first left school, but gained my Bachelor of Business via Open Universities Australia between 2005-2010. I really enjoyed study and think I could be really well suited to an academic career. Here in The Netherlands, if you have Dutch nationality, you can undertake your first masters degree with very heavy subsidies – meaning it would cost me less than 2000 euros for a year’s full time study. There is a Masters in Entrepreneurship & New Business Venturing at Erasmus University that I have my eye on and have been thinking about. Weighing up the pros and cons has kept me busy for some time already and I’m still not at the point to make a decision. Applications have to be in by May 2014 and the year starts in September 2014. Verdict: A possiblity. Need to research more. So the next option? Well, I think I’ve run out! Can you think of anything I’ve not considered? So I’m thinking that continuing my business and looking into possibly studying, while also keeping alert for suitable part time work possibilities is my best bet right now. I do strongly feel that analysing options and making plans for the future is important, but there is a big element of “surprise” in this process, depending on what opportunities are out there. Who knows, the perfect part-time job could come along tomorrow. That’s a reason I spend a significant amount of time networking online and offline as this helps learn and connect to what I hope will be the perfect career path, even if it wasn’t the exact one I initially expected. I also am also always actively maintaining and developing skills.